Back to school season is in full swing here in Florida. Facebook is filled with moms complaining about car rider lines,piles of homework, sports schedules, dance classes and everything else that is part of an over scheduled family. Family meal times have always been very important in our house. They were the priority other things were scheduled around. Family dinner time should be peaceful, relaxing, and full of talking. No phones, no TV or other distractions, just eat and talk about your day. Unfortunately that scenario has been lost in many households as parents want to give their kids more opportunities. More isn’t always better, especially at the cost of daily family time around the dining table. One way we can make family dinners popular again is by finding recipes that are easy to prepare and family friendly. This Queso Chicken recipe is one such recipe. It only takes 4 ingredients to make this Queso Chicken recipe, 3 of which are pantry staples, at least at my house. 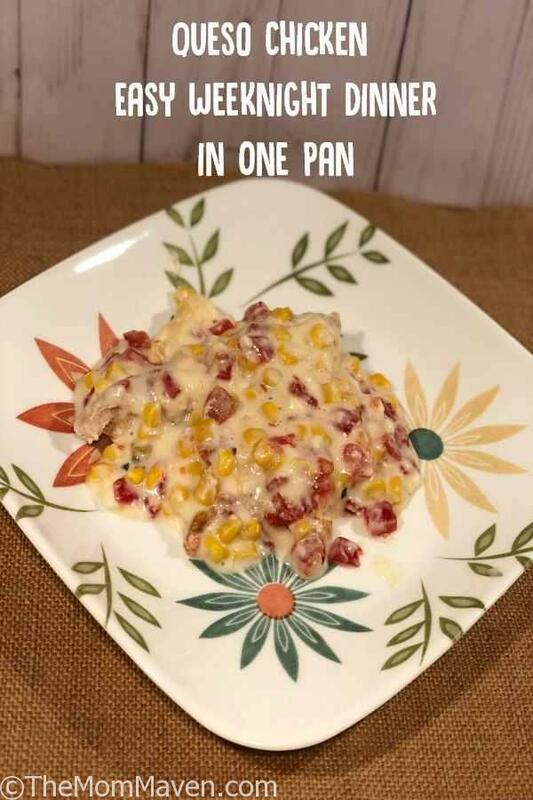 Go defrost 3 chicken breasts and grab a can of corn, a can of Rotel tomatoes with green chiles, and a loaf of Velveeta Queso Blanco and let’s get started. Preheal the oven to 375°. Line a 13x9" pan with foil. Cut the chicken breasts into strips approximately 1/2-3/4" wide. Place the chicken strips in the pan in a single layer. Pour the corn and tomatoes over the chicken strips. Dice the Velveeta into 1/2" cubes and place them on top of the corn and tomatoes. Remove foil cover and bake 5 more minutes. Gently stir together the cheese, corn, and tomatoes to make a nice sauce. Serve the chicken topped with the queso sauce. Jordan likes to eat this with tortilla chips as more of a dip. Ron and I eat it with a fork and knife. 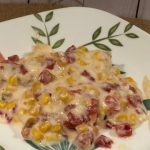 This Queso chicken recipe is a family favorite, I think I could serve it once a week and no one would complain. I hope you enjoy this recipe and all of the easy recipes I share here on The Mom Maven. I hope you share them on your social networks. I just ask that you not copy and share the entire recipe with photos. Please use the sharing buttons below and share the link to this post. Thanks!